We manage the Marin Household Hazardous Waste (HHW) Program for every city in Marin County except Novato. As part of this program, the Marin HHW Facility is jointly operated by SRFD, Marin County Hazardous & Solid Waste Management Joint Powers Authority and the Marin Recycling & Resource Recovery Association. Does Your Business Generate Hazardous Waste? Does Your Home Generate Hazardous Waste? Through the Marin HHW Facility, residents and small business owners now have an easy and efficient method of eliminating hazardous waste from the water and landfill systems in the County. Similarly, SRFD also holds two temporary HHW collection events in West Marin every year. These events are for residents only and are announced about two months prior to the event date. The next HHW collection event will be held on Saturday, October 27, 2018, in Mesa Park in Bolinas, from 9 AM to 1 PM. 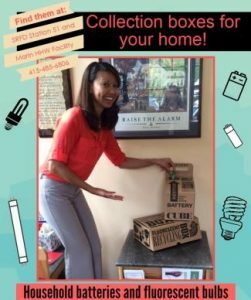 The San Rafael Fire Department and the Marin Household Hazardous Waste Facility are proud to announce the release of our residential collection boxes. Two separate boxes designed individually for household batteries and fluorescent bulbs will help residents collect these items safely in their home or garage. Once full, the boxes can be taken to the Marin HHW Facility at 565 Jacoby Street for free disposal. Boxes are available to all Marin County residents, excluding Novato. Get your boxes at the Marin HHW Facility. Call (415) 485-6806 for more information. Alternatively, you may bring your batteries to a drop-off facility. Click here for the list of facilities in and near San Rafael. Universal wastes are specific types of household hazardous wastes (HHW) that are commonly found in homes such as fluorescent lights, batteries, aerosols, and e-waste. The Marin HHW Program has launched a pilot Household Universal Waste Pick-Up Program for residents of San Rafael. San Rafael Residents can choose to have their universal waste picked up from their home instead of dropping it off at the Marin HHW Facility. In addition to universal waste, the Pick-Up Program also accepts limited quantities of latex paint, motor oil, and oil filters. Each pick-up costs $25 and can be scheduled by calling (415) 485-6806.